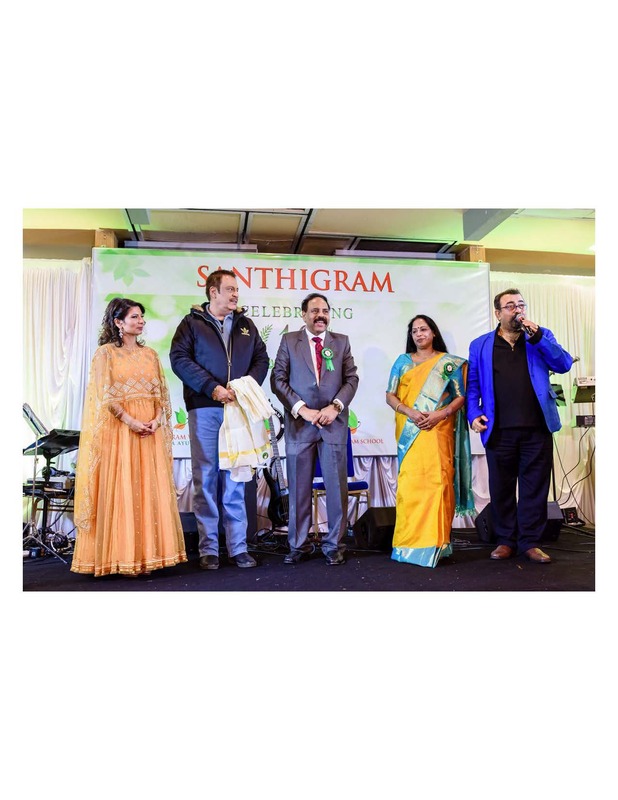 Santhigram Kerala Ayurvedic Co., USA, a leading provider of holistic treatments based on authentic Kerala specific Ayurveda and Panchakarma Therapies in the United States has celebrated its 10th anniversary in a grand function on Saturday, January 20, 2018 at Edison Hotel Banquet and Conference Center, 3050 Woodbridge Ave., Edison, New Jersey. 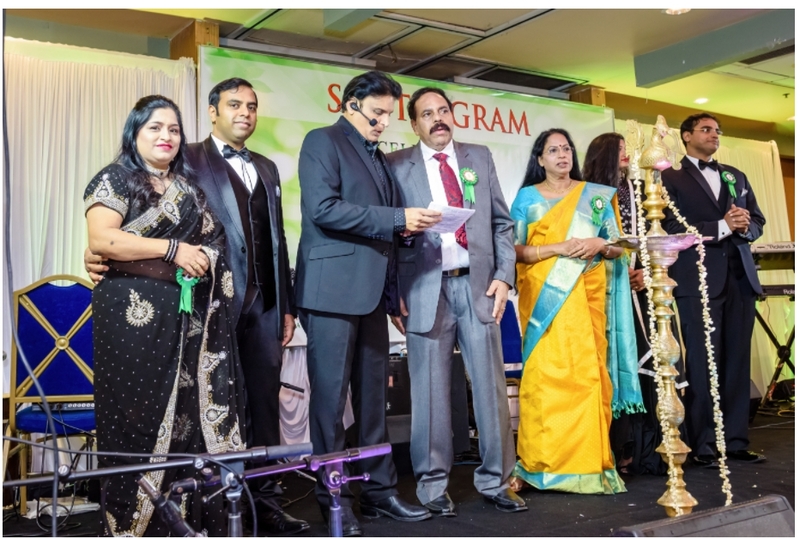 In an unprecedented and awe inspiring event in the illustrious and distinguished history of Santhigram USA, more than 500 esteemed guests from various walks of life including clients, stakeholders, friends and well-wishers from diverse locations in US including renowned guests encompassing Elected Officials, Media, Community Associations, Chambers of Commerce, business and other prominent forums graced the occasion. Among the most notable distinguished guests were New Jersey Senator Vin Gopal, Commissioner of New Jersey State Mr. Upendra Chivukula, Mr. Peter Jacob, Contestant for US Congress from New Jersey, Padma Shri H.R. Shah, Chairman of TV Asia, Padma Shri Dr. Sudhir Parikh, Chairman of Parikh Worldwide Media, Dr. Sudhanshu Prasad and Dr. Binod Sinha, prominent physicians and owners of Edison Hotel, Ms. Melinna Giannini, Health Insurance Consulting Specialist and President of ABC Medical Coding Solutions, Swami Siddhananda, Acharya of Chinmaya Mission and Deepak Parashar, the Bollywood cine actor. 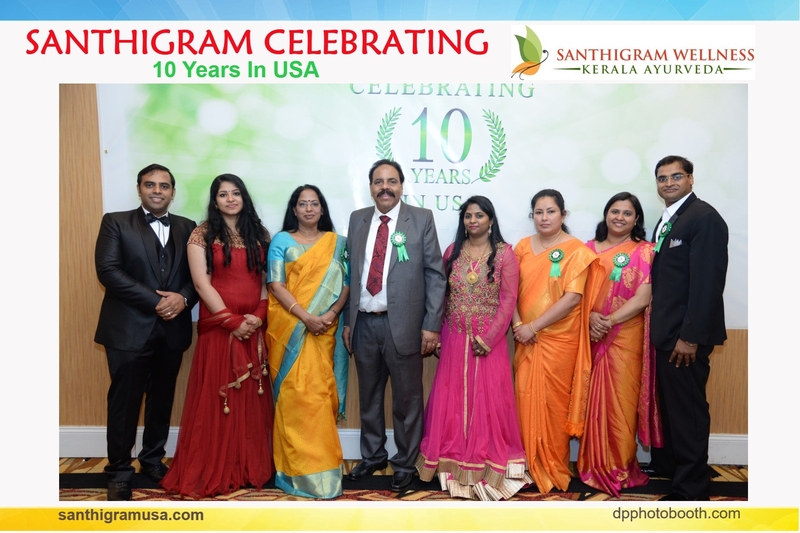 In the welcome address, Dr. Gopinathan Nair and Dr. Ambika Nair, the founders of Santhigram USA unveiled before the distinguished guests the saga of Santhigram USA operations during its decade long journey in US. 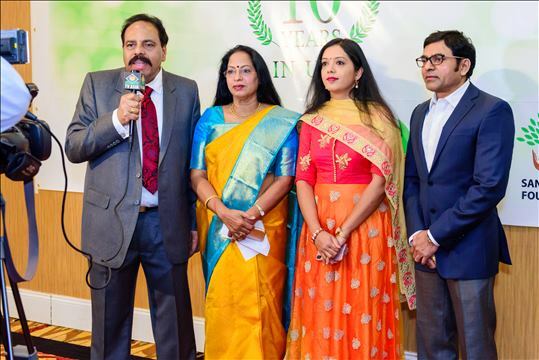 Mr. Nair said, “We humbly acknowledge the multitude of hurdles and challenges we faced, because there was absolutely no precedence in running an Ayurveda wellness business in the US. 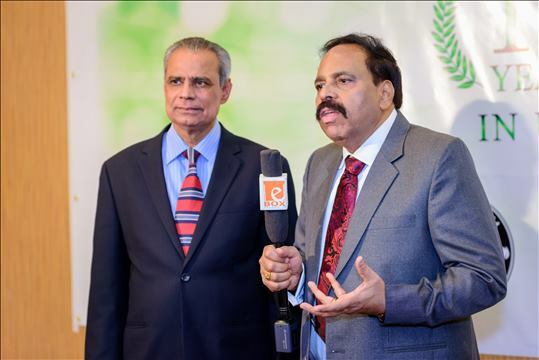 Coming to US with a dozen Ayurveda specialists in November 2007 exclusively with a mission of spreading Ayurveda wellness was a great challenge in itself.” He further said. “We are pleased to say with great pride that we have moved forward, overcoming obstacles and managed to spread our wings to as many as five states, New Jersey, New York, Texas, Illinois and Wisconsin.” “This would not have been possible without the support of our dedicated team and the clients who had absolute faith in the effectiveness of the unique system of Kerala-specific Ayurveda treatments,” he said. "It is gratifying to see that hundreds of patients have taken advantage of our side-effect-free holistic solution to take care of their health issues, but many are still not able to avail our services due to insurance regulations." “Things are changing, and we are helping our clients to get the coverage needed,” he added. 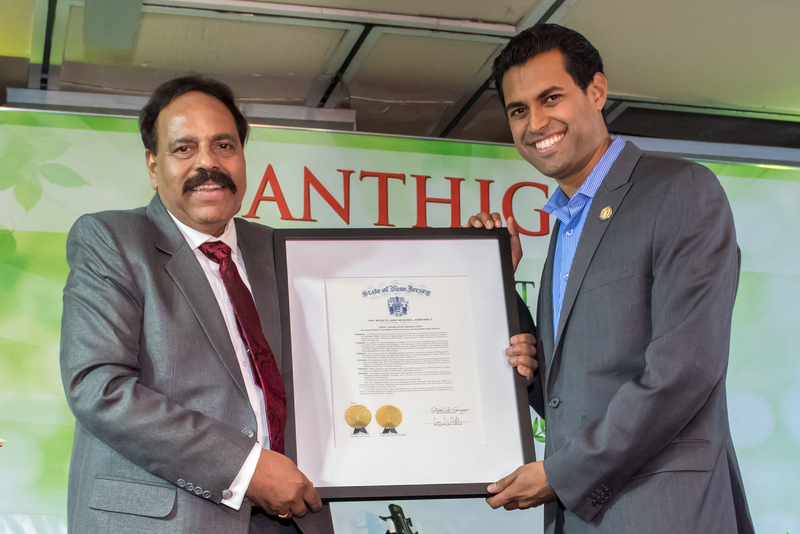 New Jersey State Senator Vin Gopal presented to Dr. Gopinathan Nair, a joint resolution of the New Jersey Senate and Assembly honoring Santhigram. It noted that the company has established a model to emulate and set a standard of excellence which others might strive. 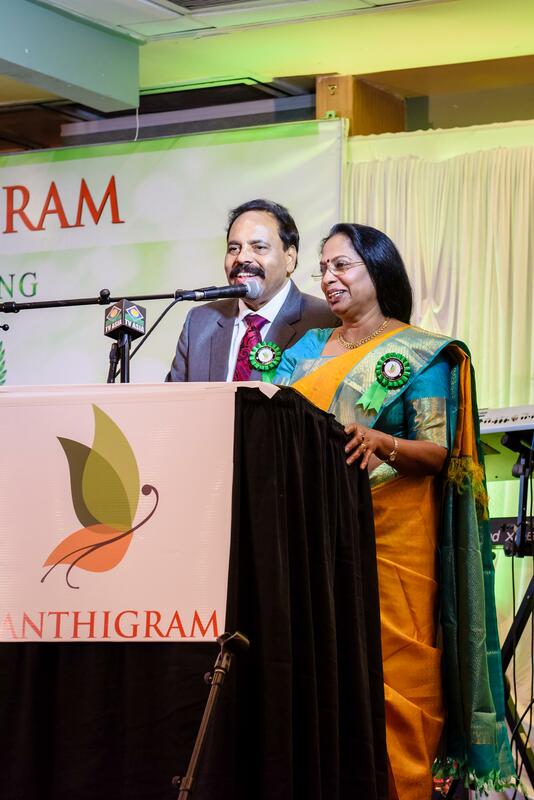 ‘The Santhigram Kerala Ayurvedic Company has grown from its humble beginnings to its present vital and dynamic state due to the capable and effective guidance of President and Chief Executive Officer Dr. Gopinathan Nair and Vice President and Chief Consultant Dr. Ambika Nair, as well as the steadfast commitment of its tireless staff. 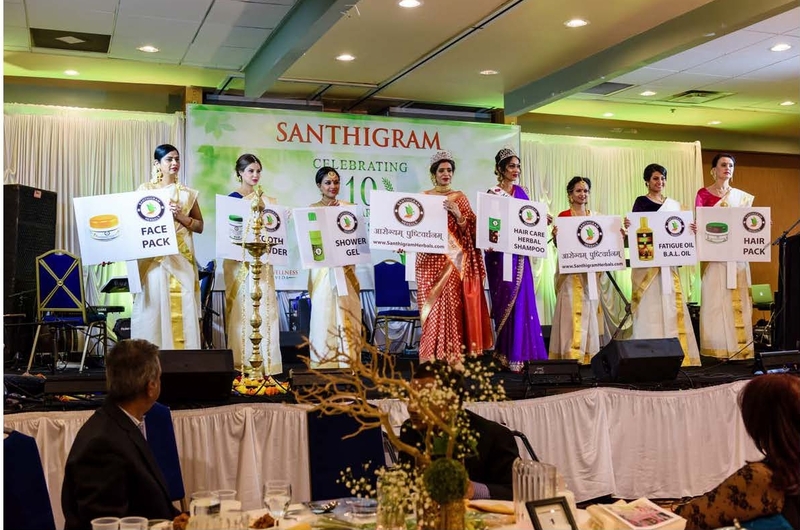 It is altogether proper and fitting for this Legislature to pause in its deliberations to recognize the Santhigram Kerala Ayurvedic Company, and to praise it as an essential and superb holistic health organization…,’ the proclamation said. 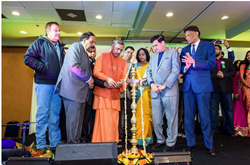 Noted guests joined the lamp lighting ceremony including New Jersey Utility Commissioner Upendra Chivukula, Congressional candidate Peter Jacob, Padma Shri H.R. Shah, chairman of TV Asia, Padma Shri Dr. Sudhir Parikh, chairman of Parikh Worldwide Media, Rajeev Bhambri, COO of India Abroad, Prof. Indrajit Saluja, editor of India Panorama, Dr. Sudhanshu Prasad and Dr. Binod Sinha, prominent physicians and owners of E Hotel, Melinna Giannini, health insurance consulting specialist and president of ABC Medical Coding Solutions, Deepak Parashar, Bollywood actor and Swami Siddhananda, Acharya of Chinmaya Mission. 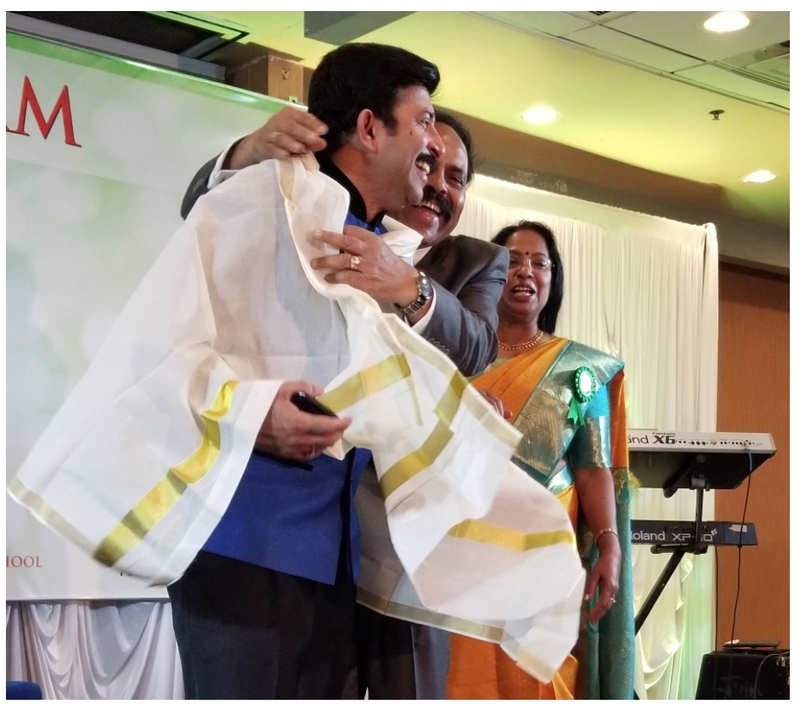 Dr. Gopinathan Nair and Dr. Ambika Nair honored several people, who helped them in the early days including Attorney Anand Ahuja, Vinay Mahajan, Late Ashok Diwakar, Alex Koshy Vilanilam, Aniyan George, Late Dr. Shakir Mukhi, CPA PK Ramnachandran, Attorney Ram Cheerath, Gulshan Chhabra, Dr. Sudhansu Prasad, Sheela Sreekumar, Dr. Prem Kumar, Attorney Thomas Vinu Allen and Commissioner Upendra Chukula. 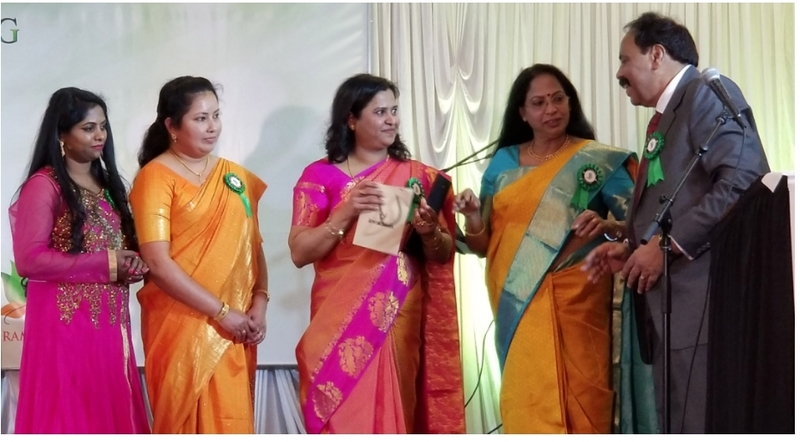 Three people working with Santhigram for the last ten years-Reeja Beegum, Sheena Mohan and Jooly Joy-were honored at the event. Employees who completed more than five years, Nishad Balan, Meenu K Mani and Pradeep Pillai too were honored with excellence awards. 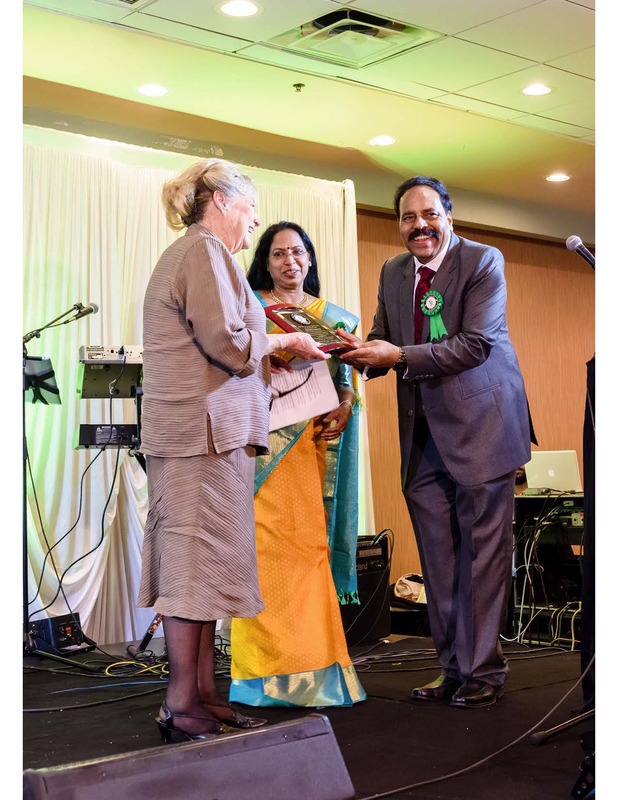 Melinna Giannini, Senior Consultant who have done yeomen service by contributing dedicated and stellar services towards marching Santhigram USA to greater heights and glory was also honored during the function. A souvenir with several articles on Ayurveda and greetings from various dignitaries from India and US was released at the event. Dr. Nair presented the details of the new projects. The Ayurveda training school has the approval of New Jersey State. 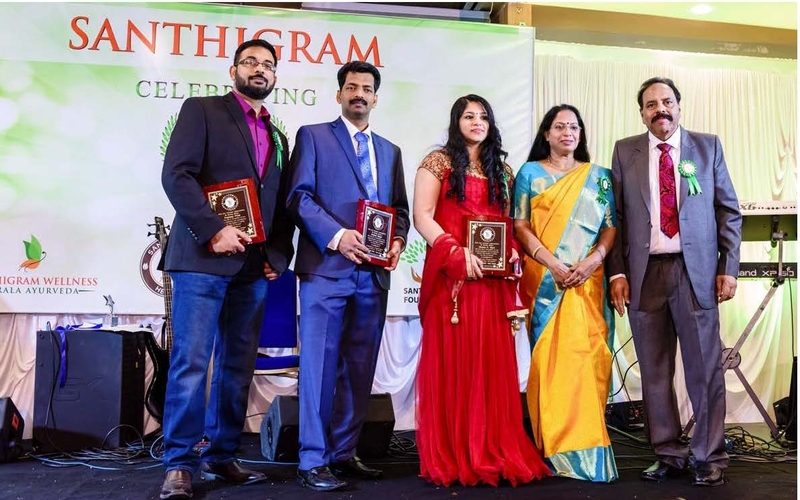 The said School is aimed to train and equip interested persons in Ayurveda modalities so that they can be employed during Santhigram’s impending expansion plans to meet the shortage of critical specialist workforce in US. The second project was introducing authentic Ayurveda products under the label of Santhigram Herbals. It includes classical Ayurveda products and beauty products from tooth powder to hair pack and shampoo. The third project, Santhigram Foundation, a non-profit charity wing of Santhigram was also launched in order to support Patients Lacking Money to Pay for Ayurveda Treatments, Seniors Needing Options to Opioids & Barbiturates, Patients Suffering from Mental Stress, Patients Suffering from Chronic Diseases, People incapacitated due to sports injuries and War Veterans suffering from PTSD, etc. A presentation on various plans of the foundation was given by Melinna Giannini, a Senior Consultant working with Santhigram to take forward its ambitious plans. Several people in the audience pledged money for the noble cause. 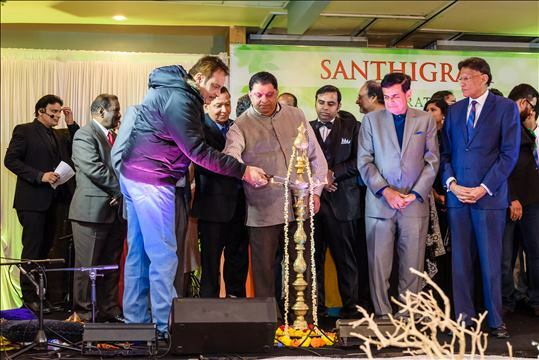 The glittering event highlighted the growing influence of Ayurveda in the US as well as the remarkable journey of Santhigram. The event began with a presentation by Dr.Drakshayani BAMS, MD(Ay) on Ayurvedic diet and nutrition. When diet is wrong, medicine is of no use, when diet is right, medicine is of no use, she quoted the old saying. Ayurveda is based on the belief that nothing is right for everyone and everything is right for someone, she noted. 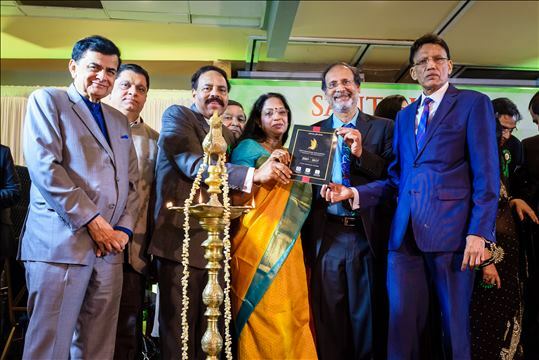 “With a proper diet and lifestyle, Ayurveda’s goal is to help each person to reach their maximum potential physically, emotionally and spiritually,” she concluded. The presentation given by Dr. Anurag Nair, a physician of modern medicine and one of the vice presidents of Santhigram noted the renaissance of Ayurveda. He pointed out that till early 20th century all medical systems were respected equally. But the new inventions changed the western medicine and its effectiveness. Life expectancy shot up and maternal mortality and child deaths came down drastically. But modern medicine came with its side effects. For example, chemotherapy for cancer will affect kidneys and liver badly. People are now looking for alternative medicines without these side effects and they have found out the value of Ayurvedic treatment. 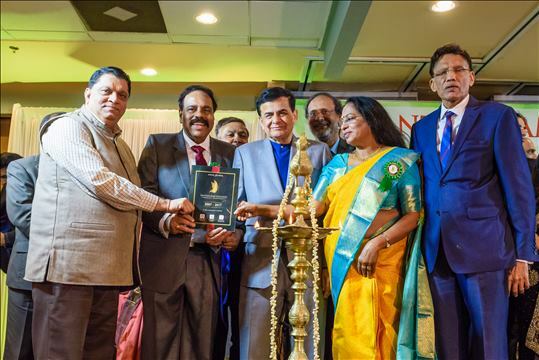 Dr. Nisha Pillai, MD, a cardiologist from New York, who spoke on the occasion has acknowledged the fact that Ayurveda is becoming more popular as a complimentary medicine with modern medicine rather than an alternative medicine. Santhigram Kerala Ayurvedic Co. of US Inc. Senator Vin Gopal handing over to Santhigram CEO Dr. Gopinathan a proclamation from combined Legislature (Senate & General Assembly) honoring Santhigram as a superb Holistic Healthcare Organization Lamp Lighting ceremony Release of Santhigram Souvenir. Dr. Sudhanshu Prasad, Padma Shri H.R. Shah, Padma Shri Dr. Sudhir Parikh, Dr. Gopinathan, Dr. Ambika Nair Santhigram founder Dr Gopinathan Nair with New Jersey Commissioner Upendra Chivukula Santhigram owners Dr.Gopinathan, Dr. Ambika, Mr. Binu Nair and Dr. Anurag Nair with its key employees Reeja, Sheena, Jooly and Meenu Dr. Gopinathan & Dr. Ambika Nair with Bollywood Cine Actor Deepak Parashar, Tanvi Prenita Chandra,and Kulraaj Anand Santhigram Founders honoring Ms. Melinna Giannini, President of Insurance Consulting company, with an award for her excellent services provided to Santhigram Santhigram Founders Dr. Gopinathan & Ambika Nair welcoming the guests Bollywood Cine actor Deepak Parashar lighting the lamp on the occasion Santhigram Founders Dr. Gopinathan Nair and Dr. Ambika Nair with its Partner of Dallas Center Ms. Sangeetha and Partner of Naperville Center Mr. Lingaiah Santhigram founder Dr Gopinathan Nair with New Jersey Commissioner Upendra Chivukula Santhigram founders with the family members and the MC Mr. Sanjeev Pandya of TV Asia Santhigram Founders honoring with excellence awards its key employees Reeja, Sheena and Jooly, who have completed 10 years of dedicated service With Santhigram USA santhigram founders honoring with excellence awards to its employees Nishad, Meenu and Pradeep who have completed 5 years of dedicated service with Santhigram USA santhigram founders honoring Aniyan George for the help he has given during initial years for establishing Santhigram Launch of Santhigram School, Santhigram Herbals and Santhigram Foundation thorough a dance with jingle.